Historic Telecom "Boy, did I get the Wrong Number" Package - The companies included in this selection are Worldcom, Global Crossing and XO Communications. These companies represent the telecom bubble gone bust. 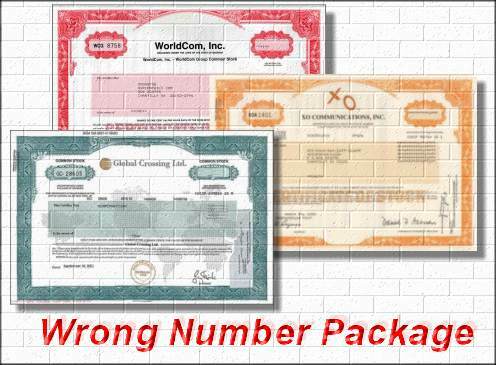 At one time, all of these companies were worth billions, but now the paper stock certificates are worth more as a collectible than the redeemable value of the stock. Many of the founders and management of these companies made millions of dollars, while the shareholders and employees were not as fortunate. 1. Beautifully engraved certificate from the Global Crossing, Ltd. . This historic document was printed by the Northern Banknote Company and has an ornate border around it with a vignette of a map of the world. This item has the printed signature of the company�s chairman ( Gary Winnick ). The certificate has not been folded and is in EF condition. These certificates have been very hard to find. 2. 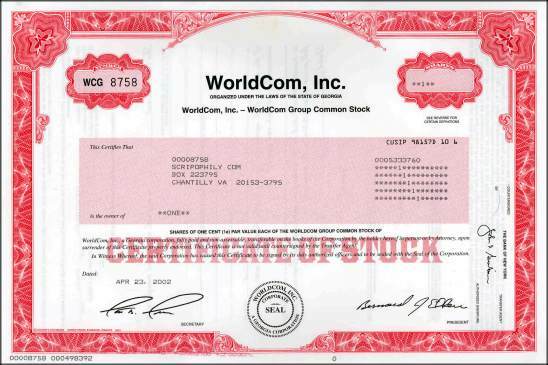 Beautifully engraved certificate from the WorldCom, Inc. . This historic document was printed by the Security-Columbian United States Banknote Company and has an ornate border around it. This item has the printed signatures of the Company�s President( John Sidgmore ). 3. 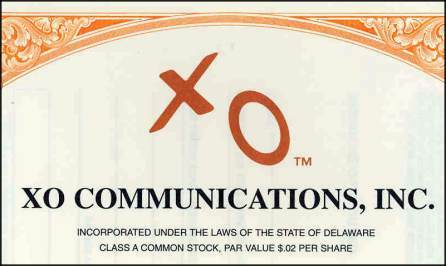 Beautifully engraved certificate from XO Communications . This historic document was printed by the Security Columbian Banknote Company and has an ornate border around it with a vignette of the company's logo. This item has the printed signatures of the Company�s President (Dan Akerson) and Secretary.